I write my mother and brother to let them know I am back at Camp Republican. Much of this letter repeats what I wrote Minnie on the same day so I'll abbreviate. Johnnie Clarke said that while I was gone, my name was called for transfer to the signal corps and I would have been stationed at Ft. Leavenworth for training. The signal corps is way and again better than the infantry. I write Minnie about being moved back to detention camp and that I expect to be issued winter clothing soon. Well I have gotten back to [Detention Camp] No. 2 & have gotten my barracks bag & am all settled. There are only six in this tent. It is a brand new tent & has a good stove in it. One of the men has a little pine table & I am writing at it now. It sure is swell here after what we have been [living] in for the last two weeks. A truck load of new winter clothing drove up in from of headquarters this P.M. so probably we will be issued our new clothing tomorrow. It looks like awful poor stuff compared to what was issued a year or two ago. Every man from the 26th Company packed up & was hauled out on trucks this evening. I don’t know where they went but I imagine it was down to [Camp] Funston. I hear that this company is likely to do the same next Tuesday. Johnny Clarke told me tonight that while I was gone, my name was called for a transfer. I would have been placed in the Signal Corps and would have been stationed at Ft. Leavenworth for training. About 18 of the boys are up for transfer tonight to go into the aviation. Either one of these corps would suit me lots better than the infantry. I got two letters from you today. You asked about the proper way to address my letters. The correct way is Pvt. so and so. We never use Mr. in the army. I know because I have heard men called for it. It is perfectly alright not to use any title at all just as you did in your last letter because it is a civilian letter. But in a strictly military letter, the military title is required & no civilian title goes. The letters will come any way they are addressed & as that is what you want & the letters are what I want, so don’t worry about how to address them. Say Minnie, I want to apologize to you & your folks for not saying goodbye. They must have thot I did not appreciate staying there, but I thot of course that I would be back Sunday evening & I could say goodbye then. And too, [your brother] Lester put himself out to come down & get me. I felt sort of bad when I left home because things hadn’t been kept up on account of Willis’ sickness. Things sure looked neglected, but of course it couldn’t be helped & we can be thankful it wasn’t any worse. The weather is so good now. I expect he will get out pretty soon. John W. and Elizabeth Hartley lived in a farmhouse close to the Griffing’s on College Hill. They had three daughters and one son, all younger than Ward and Willis. Minnie writes me that she will be paid in spite of not teaching during the quarantine. Well I suppose you are back at the D[etention] Camp again. Nathan Gish is here today trying to get me to take a $1000 life insurance [policy]. He was here this morning and I told him I wanted him to talk it over with Papa so he came back this afternoon. He’s here now. I’ll have to go out there pretty soon I guess. I felt like I might be having arrangements made for my own funeral to hear him talk. He said “it costs something to get out of this world these days” etc. It’s sure funny. Mr. Gish left. I didn’t take any insurance now. I’m going to wait till spring. Ethel [Arnold] took some out today. There was a lot of peace talk yesterday in town and the best Bulletin up there ever has been. But it seems to have died down today, Papa said. Miss Carey said she was sure we County teachers would get our money for this time lost and not have to pay. I’m sure glad. Teacher’s meeting has been postponed till three weeks from Thursday, Friday and Saturday. It seems funny they would have it then as that is Thanksgiving. It won’t be any extra vacation. I guess the authorities like that part of it. I hope the sun shines the next time you come home. I want to take a picture of you in your uniform. Be sure to let me see that picture of you in your helmet and gas mask. I want to see it sure if I can. Mrs. Signor is certainly a busy woman. She didn’t think [the chairman of the Riley County Draft Board, Mr.] Yenawine, would do her son justice. So she went down to Wichita to see the [Draft] Board [there]. She told them that there were boys here that ought to be in tho; they said she squealed on several of the boys around him – some of them young married men – a lot of the people she got sore at her. Papa got some rubber boots for the boys. He couldn’t get any black ones. He had to get a pair of white ones and a pair of red ones. They are the craziest looking things. Today is [my brother] Wayne’s birthday. I must get busy and make him a birthday cake for supper. Did you get to see any of the College Hill folks Sunday besides your folks? Nathan A. Gish was only 18 years old at the time. Mrs. Kitty Signor was the 47 year-old mother of 22 year-old David L. Signor. She and her husband Harvey lived only a couple of households away from the Charles Frey family in 1918. Minnie writes me that she expects to go back to Sherman Township to teach her school the following week. Didn’t it seem fine to see the sun this morning? Everything seemed so bright and nice – but it seems to be getting a little cloudy again. I hope it doesn’t. I have been writing in the evening and sending it with Papa most of the time, but I’m afraid he will forget to mail it sometime so I’m going to write in the evening and send out on the route the next day after this. Well about tomorrow you will be coming into camp, won’t you? Will you still have special drill there with the Company you were with out on the [Smoky Hill] Flats or will you be just the same as before? [My sister] Bertha received a telegram from [her husband] Charlie [Scholer] this morning. Bertha couldn’t hear so very well so we are going down to get it this afternoon. He wants her to come in two weeks with Capt. Seaton, and he had a new place out from Washington [D. C.]. What did you think of my school? You didn’t think much of it I guess or you would have said. The picture looks like any group of youngsters but it’s interesting when you know them. I have a lot to do for my school this week, I’m sure. I’ll be able to go back next week. As soon as I find out just when the Bi-monthly comes, I’m going to begin planning for a program for us to have when we have a social sometime between Thanksgiving and Xmas. The children are pretty small but I’m sure crazy to have a good one anyway. P.S. 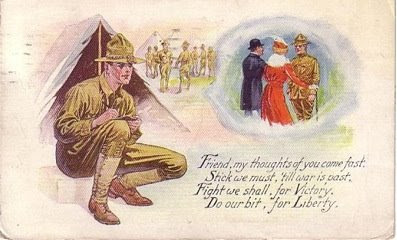 I started to address your letter last night, “Pvt. W.C. Griffing.” You corrected me when I said “Mr. Somebody” Sunday evening. You said, “They aren’t Mr. when they are in the Army.” But Eben said, “No, Mr. sounds lots better and it doesn’t make any difference.” So I left it clear off. It will get to you either way. But Pvt. is really right, is it not? Had our [mock] battle this P. M. & turned in our stuff tonight. Strike camp & go back to [Detention Camp] No. 2 tomorrow A. M.
We were complimented on our work here today & were reviewed by General [Leonard] Wood. Minnie starts a letter to me on Saturday and completes it the following day after my surprise visit to Manhattan without a pass. We hadn't seen each other for six weeks. Well it’s still raining and cold. It sure is sloppy weather here. I don’t suppose you have to drill this kind of day, do you? The grandest boy in the world – and the one I love the very best – just then called. How happy I was to quit writing to him and wait for him to come out. Gracious, boy, but I was so happy I couldn’t think. I’ll bet you thought I was rather queer. I told you in one of my letters I had so much to say to you but I haven’t yet. Maybe when you make a few visits like that I’ll be myself. But honest boy, everything just flew from my thoughts. All I could think from the time you stepped in this house till you left was, “Ward is really here” – the thing I’ve wanted to happen more than anything else for two months. I’m so glad you got to come. I’ve food for thought till you come back again. Today would have been a lonesome one sure enough if Eben hadn’t have come out. He is a very interesting talker, and all we did was sit around and listen to him talk. I haven’t talked to anyone over the phone or anything. I hope your folks didn’t think you were too generous with your visit with me. Boy, it was great to have you here. I have been happy all day thinking how very happy you have been being with your mother and Willis all day and being at home. Do you feel like that visit was worse than none at all? I sure don’t, Ward. Boy I believe if I could hear you tell about your work a little oftener, as you told me about it last night, I could get just awfully interested in it. And some of the horror seems to leave. I didn’t think I would enjoy that kind of work, but I do. Ward, army life certainly isn’t hurting your looks any. You look better to me every time I see you. You just have such a good look that’s just irresistible. And that is not any of Minnie’s flattery either. Everybody thinks so. I am mighty proud that a fine soldier like you thinks lots of me. Don’t catch a cold dear [in] this weather and still get the flu. I just live for you boy. I know if it wasn’t for you, nothing would seem worth while. 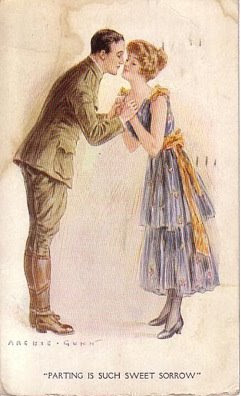 I know one good thing that’s going to come of this war – I’m going to be a lot better girl. [It will] probably not [be] anything that’s visible but I feel it. I hope nothing comes to the worse for your staying today. If it does, I will be sorry you didn’t go out to your home last night. I would rather anything happen almost than for you to get in trouble on my account. But you always are in the right it seems so I just always trust to Ward to know and don’t worry. You said in one of your letters, “Just believe in me Minnie and everything will be alright.” You don’t know how glad I am, Ward, you said that. It has done me more good. I just say that over to myself and it makes everything alright. I don’t believe there ever was a girl that ‘believed’ more in a boy than I do in you. Well I expect you are back in camp by this time. Did you find your stove up, and was your bedding awfully damp? Stella [Munger] just called [but] didn’t have anything of interest to say. I begin a letter to Minnie on Saturday morning telling her about field training. I don't finish the letter until Sunday evening after slipping in a visit to Manhattan to see her without a pass. Rain & Mud! Rain & Mud! Gee Whiz, it rained nearly all night & cold! Oh no it is not cold. We are sitting around waiting to be called out any minute so I will start a letter & if I don’t finish it now, maybe I can tonight. It is raining now & we are ordered to be ready to go into the trenches at 1:15 with rifle, bayonet, gas mask, blanket, shovel, etc. Doesn’t that sound like fun? I’ll bet the water is knee deep in some places in there. I wrote you a card last night & said that maybe we would get into D.2. Sunday. Today we have heard that we won’t go until Tuesday. That means 3 more days in this nice, warm, clean, dry & perfectly grand place. But 3 days is about 1,000,000 times better than six weeks. That is what the order was when we moved camp. The last letter I wrote to you I sent to Stockdale because I supposed you would be teaching. That very same day I got your letter saying that you would be home. I am sorry because you won’t get it for so long. I haven’t gotten any mail from you for 3 days now & none from mother for 2 days. I sure want to hear something pretty soon. This morning we had to get up the usual time 6:15 & slop out in the rain to stand reveille. Then we lined up for mess & stood & shivered in the chow line for awhile till they said that there would be no breakfast for an hour & a half. The water had run into the kitchen & put the fire out. When we did get it, it was bread, potatoes, corn flakes, pet milk, prunes & coffee. The coffee out here is simply terrible but it warms a fellow up. Oh joy, I’ve just been up to the supply tent to buy me some candy (at least that is what they call it) & I heard that the battle is to be postponed. Sometimes the officers show a gizzard if they haven’t any heart. Now it can rain as long as it wants to because I expect we will not have to go out at all today except to get our fodder. I got those pictures [you took of your school children] the other day. They sure were interesting. It looks as tho Sherman [Township] could furnish her quota of soldiers judging by the male members of the district school. I would like to see some more pictures of you & the folks. I am still hoping that I can get a pass some time but it won’t be for a little time anyway. We have heard that the quarantine is to be lifted today at Camp [Funston] but I don’t know whether that is true or not. It would be just my luck to get a pass on a real stormy Sunday & you would be up to your school. But believe me, I won’t turn down any kind of a pass – just so it’s a pass. I would give a lot just to get a pass to Ft. Riley. This is Saturday. Let me see. Guess I’ll go over & see Minnie tonight. It is rainy & cold; she will have a dandy fire in the fireplace & maybe some popcorn to pop. Well here I am again instead of being in a big chair in the parlor of a certain house on the Blue Valley road. I expect Martha will have told you about that fellow calling me up today at noon. He called up & the first thing he said was, “I’m afraid we are caught.” So we arranged to meet at the hotel & get right back to camp. When I found him he said that he was eating in the College Inn & another man from College Hill recognized him & said that he had heard that they were moving camp today & that it would be best for us to be there. Well we fooled around town a little & then got on the trolley & went to Ft. Riley. We caught a jitney & went out to [Detention Camp] No. 2 & found out out there that the camp wasn’t being moved so we didn’t hurry back over. We fooled around at No. 2 & had mess there & then caught a jitney back to Ft, Riley. Well we thot that we might just as well be hung for sheep as lambs so we went to the Ft. Riley [Post] Exchange & filled up on sundaes etc., & then walked on out here to camp. The fellows here in the tent had the dandiest fire going. The little stove was red hot & they have a can of water against the side of the stove that is actually steaming. I am going to shave tonight so as to have hot water. Gee! But it is fine in here compared to what it was yesterday. There wasn’t enough stoves, nor pipe enough to go around so we sure are lucky. The boys said that no bugles blew last night & none this morning, no formations at all so we will get by like a streak of lightning. They say that we are likely to go in tomorrow without pulling off that battle because the trenches are in awful shape. Shucks, after we get a nice fire & then move us out. Guess I’ll ask them to let us stay longer. Another thing I heard while at No. 2 was that very likely the whole Depot Battalion will be transferred to [Camp] Funston about the 5th of next month. I won’t mind that a bit, will you? Jitney was originally a slang word for a nickel, or five cents. The word then came to be used for a bus that carried passengers along a regular route, since the fare for these rides were five cents. Buses like this continued to be called jitneys long after the fares rose. The word's first known appearance is in 1903, in the 'nickel' sense. The 'bus' sense is first attested in 1914, but seems to have become popular very quickly, since we have a number of pre-1920 examples of the term. The ultimate origin of the word is unknown. 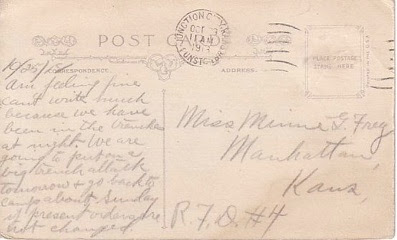 Minnie writes me news from Manhattan and lets me know that Harlan Sumner has been taken prisoner in Germany. Had a card from you today [and] was certainly glad to get it. But I’m afraid, Ward, the card was more appropriate for you than me. I had Mama ask at the Post Office for my letter but it wasn’t there. I’m afraid I won’t get it at all. I haven’t had a letter since the one you wrote a week ago last Sunday just before you went out to the [Smoky Hill] Flats. Your mother said I could read their letters if I would come over. I think I’ll go tomorrow. She had a letter and a card today. [My brothers John and Wayne] worked over there today. John read your letter. He told me a couple of things you said but I can’t get much satisfaction out of him. John said you thought you were getting the flu one night. I’m mighty glad it didn’t turn out to be. It’s been so cold and damp this week. I’ve sure been thinking of you constantly. Ethel [Arnold] came down this afternoon. It seemed nice to have the monotony broken and it’s the same for her. I guess there will be no school for we school mams’ again next week. We are getting anxious to get back. I hope the quarantine will be lifted at [Camp] Funston just the same tho. Ross Arnold was put in Class C. He only weighed 119 pounds. Harlan Sumner has been taken prisoner by the Germans. Something got wrong with his engine and he had to come down behind the German lines. Ethel said Ray went out Tuesday to see you and another boy by the name of White who is also in the Depot Brigade. He found Mr. White but couldn’t find you. Ethel wanted to know where you were so he could find you another time. I told her you were still there but was out on special duty the last 2 weeks. I expect Ray will start out again. He has quite a lot of time off. I guess I’ll have to send this. I had to stop writing and entertain [Bertha's infant] Ruth. She’s got her temper up and she sure gets cross. Bertha has a cold and aches all over. I sure have been scared this evening. I’m so afraid she will get the flu. But we’ve just about decided it wasn’t. Harlan R. Sumner was a 19 year-old student at KSAC in 1915. 1Lt. Harlan Sumner served as a pilot with the 139th Squadron, USAS, from 13 February 1918 to 26 September 1918 when he was taken POW. Source: Wings of Honor, American Airmen in WWI by James J. Sloan, Jr. It appears that Harlan served on the faculty of the KSAC Agricultural Department in the 1920's. Am feeling fine. Can’t write much because we have been in the trenches at night. We are going to put on a big trench attack tomorrow & go back to camp about Sunday if present orders are not changed. Minnie writes me all the news from Manhattan. I’m sure going to half to write this in a hurry tonight if I get it sent with Papa – and I sure want to. I suppose you know by now that General [Leonard] Wood is going to lift the quarantine Saturday noon. Isn’t that perfectly great? I’m so happy I’m almost flying. Sure am looking for you home this weekend. Hope you are well yet. Everybody here is alright now. I was talking to [your brother] Willis tonight. He says he’s been up nearly all day. He thinks someone ought to be giving a party [as it’s] getting near Halloween. I told him I didn’t think anyone ever thought of a party anymore. I went downtown this afternoon, met Stella [Munger], and we were going up to Miss Stuart’s. Stella suggested that it might not be a bad idea to call and see if she was to be at home before we went up. So we did. She was not there, but it happened we met her on the street. [We] had a dandy chat but short. She said High School didn’t seem the same since we left. They missed us. I don’t see how it could. It must be rather quiet since we’ve left. Willis wanted to know why Ethel [Arnold] and I didn’t come over to see him. I told him I wanted to know it was perfectly safe first. I think I will go over the last of this week. I bet Willis sure gets lonesome housed up so long [with the flu]. My, I hope you won’t half to drill Sunday or anything like that. I can’t hardly write or think anything but that you are coming, coming, coming. We talked to Georgia Moffit today. She said college wasn’t so very much fun. About all the boys belong to the S.A.T.C. and you can’t ever see any of them. She says her [school] work is easy tho. I’m glad to hear that because she is taking the general course and has some awfully hard subjects. And I am about to the place where I’m afraid to start in to college. [I’m] afraid I can’t learn and would flunk out in everything. Well I can still eat my three squares a day. Got 2 letters from you today. The weather is improving & things look a little better. Had another battle today only on a larger scale. I tell my mother and brother about the trench attack we staged and also about what we hear as far as camp rumors. Well, I can still eat my ration of beans and cabbage with the rest of them. This living in the open and working as we do sure gives a fellow an appetite and I have never felt better in my life. I sure had a sore foot a few days ago. The issue socks are thin and when they got wet, they rolled up behind my heel, and before I came in at night I had a good sized blister. The next day I wore them again and of course that made it no better. The blister festered and swelled. Believe me, I had a hard time dragging that foot around at 120 steps per minute. I have been wearing those woolen socks you sent me since Sunday and my foot is well now. I am not going to wear another cotton sock as long as I am in this army if I can help it – and maybe longer. Those wool socks are so much better when a fellow keeps getting his feet wet. I thot sure I was coming down with the “flu” the other day. My head ached severely and I just felt bum. I went to bed early and I am sure I had a little fever, but I was so determined not to get it that I didn’t report to sick call in the morning. It was rainy and nasty and we went out and dug trenches. Pretty soon we were called in and policed up camp, and were given the rest of the forenoon to clean our pieces and police up ourselves. I sure was glad because I had a chance to keep in the dry. In the afternoon, we were ordered to strike our tents and we moved camp back farther away from the river. That was last night. Tonight we are so much at home here as tho we were born here. This is a better place and the camp is lined out better because it is to be here for quite awhile. They even started a good road in front of the kitchens. We understood last night that we were to stay here for about six weeks, but again today we hear that we are to return [to Camp Republican] at the end of the week. So you know just as much as I do how long I will stay here. We men out here will probably do one of two things – either be transferred into the 10th Division, which has now started to move, or be held as the skeleton of a new division which will be formed at Funston as soon as the 10th moves. We have heard both things and don’t believe either. The weather sort of half-way cleared up today and things are getting dried off a little. We had another trench attack today, only on a larger scale. The riflemen were issued 60 rounds and the automatics 120 rounds. The bombers had eight grenades apiece. Some of the fellows get so nervous they don’t want to throw their grenades but I think it is more fun than a picnic and it sure is good practice for a fellow because we have to charge thru wire entanglement and charge over trenches. Well, I hope Willis is all right now but I expect he doesn’t feel very well yet. This is bad weather for influenza. There is a fellow in my tent has a stationary outfit that is might handy for the barracks bag. I wonder if you could find one in town like it for me. It is covered with paper and folds like a book. These are pockets for envelopes and stamps and letter paper and a tablet, and places for pencil and pen. It is handy and everything is together. A fellow just now came in who had gone over to the camp after some of his luggage. He said that there was quite a lot from there transferred to the 10th [Division] but that the men who were over here and had their names on the transfer [list] were crossed out so maybe we will not be in the 10th after all. 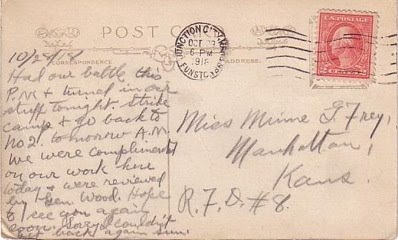 Minnie writes me that she hears the quarantine at Camp Funston will be lifted soon. She also says that my brother Willis is nearly recovered from the flu. I didn’t get to write to [you] yesterday. This evening is the first since Monday I’ve felt good enough to write to you. I’m going to write every day tho the rest of the week. Your mother said you only had two letters from me last weekend. I know there should have been at least four if you didn’t get them since the Sunday before. I haven’t heard from you for a long time and expect it will be a longer time yet. Your mother said she had a letter from you yesterday. I’m glad you like your work and hope you get to stay at Camp Funston a long while yet. Maybe you will get a chance to come home soon. Papa heard today the quarantine was to be lifted at Camp Funston. My, but I’m glad. If that’s true, there’s only one thing then stands in the way – that is your pass, but you surely will be able to get that. I was so disappointed today. 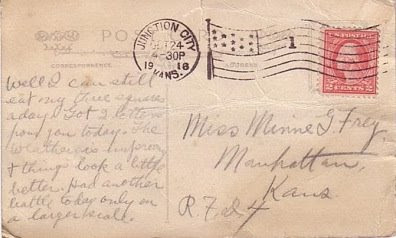 I thought maybe I would get a letter from you, and here came a card from the Camp Funston Post Office saying a letter was held for [insufficient] postage. I’m going to send it tonight but it will not get here before Saturday and probably not till Monday. My, boy, you don’t know how I hate to half to wait for that letter. I want it so bad. Mrs. Arnold was down this afternoon. She heard from Cecil yesterday. He’s just fine and has been right up to the front lines lately. Brownie had a letter from Ernest again. She said it was anything but cheerful. I guess he’s getting tired of staying in one place so long and he says the scenery is getting old. He’s down in the Southern part of France near the seacoast because he writes that he walks down to the shore often. He hasn’t been doing a thing. Ross Arnold and John Hylton were downtown today for their physical examination. Ross just about didn’t pass because he is so small. John didn’t pass the examination at the college. I think it is a shame. He hadn’t entirely recovered from the ‘flu’ was the reason. They said his heart was weak. Everett didn’t have the ‘flu’: he was sick from vaccination and they thought it was the influenza, so they sent him to the hospital. He’s alright now. Homer sure had it tho. [My sister] Bertha has hopes of getting to leave soon. [Her husband] Charlie [Scholer] says the epidemic is dying down in Washington [D.C.], and it sure is around here. Only two new cases at college today, we heard. Stella [Munger] and I are going down to see Miss [Stella K.] Stuart this week. She told [my brother] John we had better come. She wanted to find out how we were getting along. I just now had to stop writing to you to write a business letter for Papa. I sure like to do that and if I’m around Papa nearly always asks me to. I wish I could clear up this weather. Isn’t very nice for you dear, is it? And I’m afraid if you don’t get to drill during the week, they will make you drill on Sunday. And I want you to do something else lots different, if it is possible. I heard one of the finest compliments on you the other day, Ward. I don’t think I had better tell you now. You know, it sounds so funny [to hear] everyone talking about Xmas presents. You know they have asked that they all be sent (those that go thru the mail) by December 5th. And the boys in France by the 15th of November. P.S. Of course your mother tells you that [your brother] Willis is getting well fast. He’s up and around the house now. I don’t believe any of us will get it now. It’s almost thru with. Ross D. Arnold was Ethel Arnold’s 19 year-old brother. John B. Hylton was the 19 year-old son of house carpenter Albert Hylton and his wife Hattie. I write Minnie to let her know I am still at the Smoky Hill Flats training area but we have moved our camp to higher ground. Well kid, I have another new home. General [Leonard] Wood came out here this morning and issued an order that this detail would stay here for about six more weeks. The place where we were camped was terribly muddy so we had to move back on a little higher ground & make a more permanent camp. We are in a lot better place although it is quite a ways to water. But we can’t expect to have all the advantages. We hear all kinds of reasons why we had to stay out here & we can’t believe any of them. One that sounds reasonable is that there is a strict quarantine on Detention Camp 2 [D.2.]. They will keep us here & send us to [Camp] Funston sooner. But again we hear another rumor that the quarantine goes off tomorrow. At any rate, we are here until about Thanksgiving. I don’t know what will be done about passes after the quarantine is lifted, but I know it will be some time before I can expect to get one. Even if it is a little unpleasant here, I am glad I got a chance to come because the fellows left at [detention] camp have just been monkeying around the whole of last week. I got the letter today that you wrote on the 17th, one from mother, & one from [my sister] Gussie. It was the first mail for 5 or 6 days & believe me, it was welcome. You can write everyday now & it will come to me fairly regularly now. Last Sunday I got a pass to D.2. to get some more of my luggage & to take a bath. As soon as I saw John Conrow, he told me that [my brother] Willis was sick with the influenza. Well it sure struck me in a heap. I had no idea that he would get sick. I had gotten no mail from home telling about it so I went over & put in a call at the “Y.” I had to wait about an hour for an answer but finally I had quite a good talk with mother. She said that Willis had been sick since Monday [Oct. 14th] so you see how the mail service is out this way. Well it relieved me to know that he was getting better but I don’t see how they get along with him in bed. It looks as tho it should have been me who should have gotten sick. I sure hope that this weather clears up & gets settled or we will be sick here because we don’t stop for rain, mud, or anything. Maybe it is a good thing to get accustomed to mud because that is the only thing we will have a plenty of over there except cooties. We were issued several overcoats Sunday morning & believe me, they sure are warm. My issue socks were thin cotton & when they got wet, they rolled up behind my heel & before I came in at night, I had quite a nice blister. The next day I wore them again & of course my heel got no better. Sunday I put on my wool socks & have been wearing them ever since. They fill up my shoes better & when they get wet, they absorb the moisture. My heel festered in the blister & believe me, it sure hurt to keep up the regulation 120 steps per minute. I have had it dressed twice now & it is lots better. We moved today and didn’t have to drill on it tomorrow. It will be alright I think. You asked if John Conrow came with us. No, it was Aubrey. John probably would have but he was put on guard the night before we came over. As I understand it, these men will instruct the rest but, of course, things are changed overnight in the army. I don’t think it is probable that we will go with the 10th [Division] although it is altogether possible. I sure hate to think of staying out in this camp till Thanksgiving but I suppose it could be worse. The worst part is that the field kitchen is not as efficient as the cook shack & there are no floors in our tents. But I think maybe they will improve things a little if we stay here so long. I wonder if you are teaching school this week? I am going to address this to Stockdale & take the risk. Have you gotten those grain samples yet? I don’t know what kind of shape they are in. I am sure getting a lot of experience out here & am learning how to soldier, if you know what that means. Well maybe I can spoil another page of good paper. This bunch that was drafted September 5 is the largest bunch that has hung together so long in the Depot Brigade. Three weeks is usually the limit but we have been in now nearly two months. If no changes are made, the Brigade will form the skeleton of a new Division which will be formed up at [Camp] Funston as soon as the 10th [Division] can move out. These beastly quarantines have kept the 10th [Division] here nearly a month longer than the original plans & there is no telling how much longer. That fact only prolongs the war. Augusta Griffing, called “Gussie” was Ward’s older sister. She was born 16 August 1885 and was married to Harry Vaughn Harlan 15 November 1905. They lived near Washington D.C. where Harry worked for the Department of Agriculture. Minnie writes me about riding horses with her friends. Mentions Willis’ bout with the flu. We are awfully busy this morning but I want to get a letter off to you before the mail man comes if I possibly can. We are washing and have a lot of hay bailers for dinner. Yesterday morning we didn’t get up till late so it wasn’t very long before dinner time. After dinner, I read three magazine stories and had just tried to get a call thru to Mrs. Parkerson when I heard someone outside yell, “Minnie.” I thought it sounded like Stella [Munger] so I skinnied out there and there was Stella and Kate a horseback. I had them come in while [my sister] Bertha and I got ready. Then all four of us went out riding. My, but I had the most fun. We went down past Strong School, then straight east on that road till we came to the [Blue] River. It’s the first time I’ve been down there. When we came back, the boys put the saddle on [our horse] Dan and Kate got on him. I didn’t want her to [get on] at all. I was afraid she might get hurt. But she wouldn’t listen to me. She’s the first girl that’s ever been on him. He didn’t do a thing. The folks said he would be alright for me to ride if he gets a chance. I’m sure going to ride him this week. Well, altogether I had just such a good time, and then best of all, when we came home, Mama said you had called your mother. While Mama and [your mother] were talking, someone [on the party line] wanted the phone to call a doctor, so they were cut off. Stella and I went over to your mother’s and she told me what you had to say. It was so dark then that Stella came home with me and staid all night, [then] went home in the morning. Who told you [your brother] Willis was sick? Conrow? I don’t suppose it makes much difference but I was talking to your mother the Tuesday morning [Oct 15th] when they had decided Willis had the “flu” and I asked her if she had written it to you. She said she had not, and we thought it just as well not to say anything about it till he was well. It wouldn’t help matters a bit for you to worry about him. Mama talked to your mother a few minutes ago. She said Willis was getting along real well. He’ll be alright now. I would hate to have your Mother get it. She’s so kinda worn out, but I don’t believe she will. There don’t seem to be any that age get it. I’m feeling fine about you, boy. Your mother said you sounded like you were in such good spirits and then you are alright. That certainly is grand. If I were [James] Sparks' girl, I wouldn’t be very proud of him if that’s the way he has to get off to see her. I’m glad, Ward, you don’t do that way, even if we would love to see one another. I have given up hearing from you at all this weekend when I heard you were to be out there yet this week. I surely was glad when I did. I suppose you got your mail since you were at the D camp yesterday. I talked to Mrs. Parkerson this morning and she said everyone up there [in Sherman Township] was well but didn’t expect to have any school. 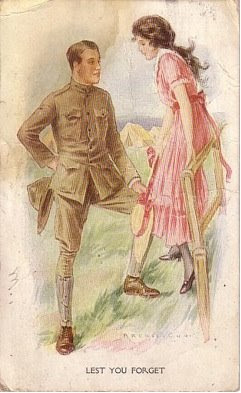 She asked me how the soldier up at Camp Funston was. She knew I was awfully anxious about you when I left up there. Stella and I are going to Topeka to the Teacher’s meeting. I think it’s about two weeks off. I’m sure looking forward to it. That French Lieutenant is going to talk one day on “The Battle of Verdun.” You know he was that grand man we heard talk last winter. I didn’t expect to ever hear him again, and I’m sure glad of the opportunity. He’s great.